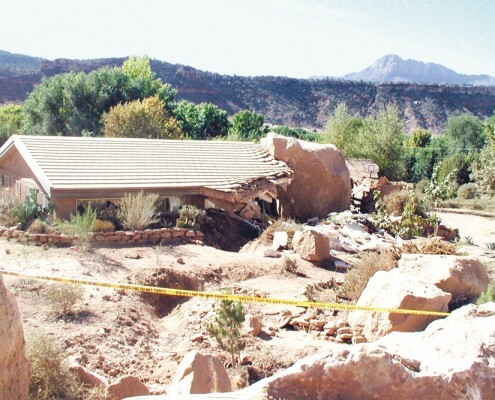 Home in Rockville, Utah struck by a boulder that dislodged from an adjacent cliff. Note the gouge where boulder bounced across the yard. On Thursday October 18, 2001, at approximately 5:30 a.m., a large boulder dislodged from a cliff face along the south side of the Rockville Bench in Washington County, rolled and bounced down slope, and struck a private residence. 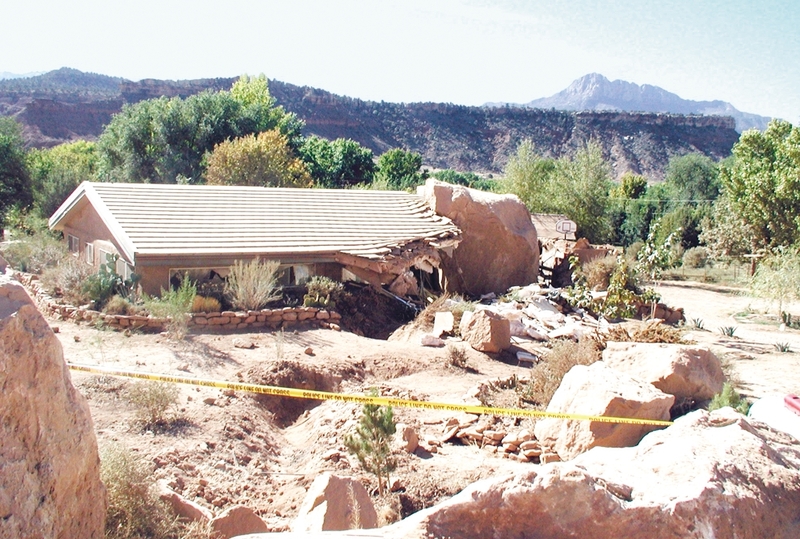 The home, located in Rockville, Utah, a few miles west of the Springdale entrance to Zion National Park, was severely damaged. 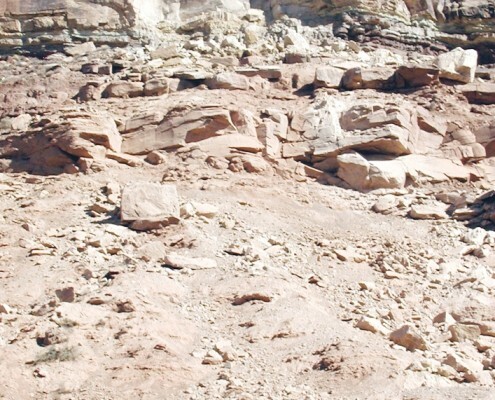 The boulder, measuring approximately 16 by 16 by 12 feet and weighing an estimated 200 to 300 tons, broke loose from an outcrop of the Shinarump Conglomerate Member of the Upper Triassic Chinle Formation, which caps the Rockville Bench north of the Virgin River. The wellindurated Shinarump sandstone and conglomerate beds rest upon less-resistant shale, mudstone, and silty sandstone beds of the upper red member of the Moenkopi Formation. The Shinarump outcrop stands about 200 feet above the adjacent valley floor where the damaged home is located. 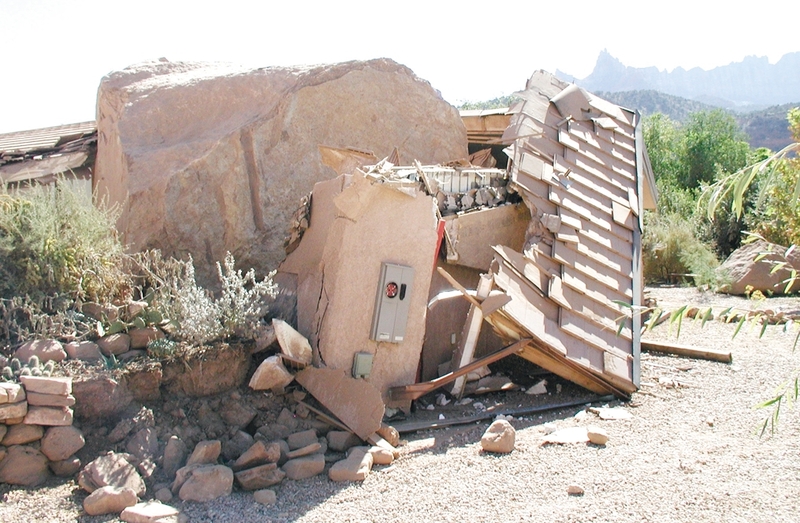 The boulder was part of a larger rock fall that consisted of several boulders, at least one of which was considerably larger than the boulder that hit the home. Fortunately, the other boulders came to rest on a dirt road at the base of the slope. However, the damaging boulder continued to roll and bounce across the road and the yard of the home, leaving deep gouges in the yard before hitting the house. 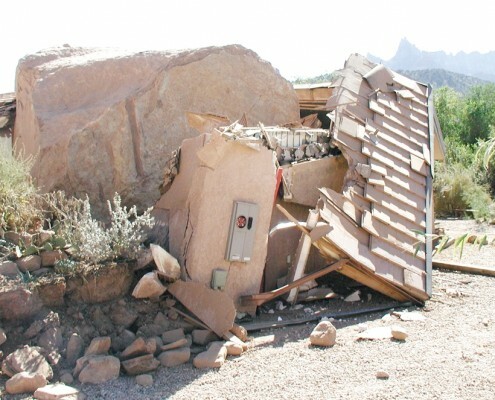 The boulder crashed through the outside wall of the home and entered a bedroom, narrowly missing the sleeping homeowner. In addition to the bedroom, the boulder destroyed the adjoining bathroom, service area, and living room. Other fresh-appearing rock-fall scars on the Rockville Bench cliff face and numerous boulders on and at the base of the steep slope capped by the Shinarump Conglomerate attest to the frequency of rock falls in the area. Even so, this rock fall was unusual in that it lacked an obvious triggering event. The weather was dry and had been for some time, so storm-related precipitation was not a factor in the failure. Similarly, no earthquakes were recorded at the time of the failure and none occurred in the area for some time prior to the rock fall. Therefore, this rock fall apparently resulted from the cumulative effects of gradual erosion and gravity. The Moenkopi strata that underlie the Shinarump sandstones and conglomerates are more susceptible to erosion than the overlying harder rocks. Over time, erosion of the softer Moenkopi strata undercut the Shinarump beds until the force of gravity was sufficient to cause the cliff face to fail. 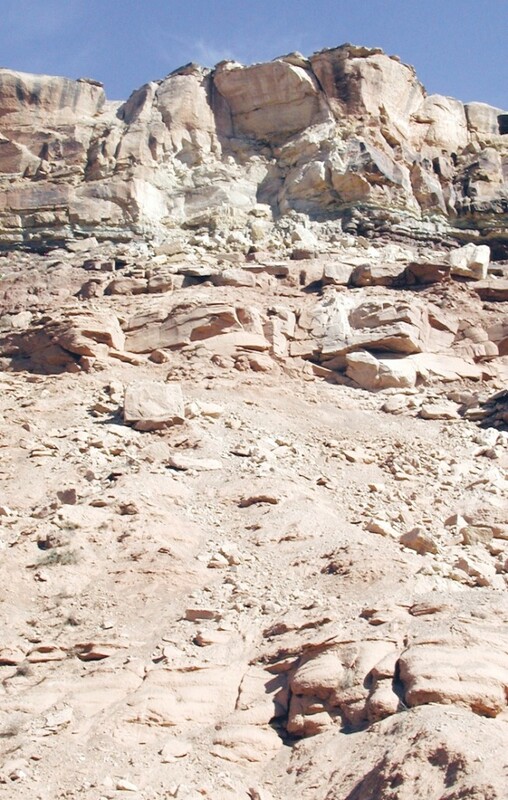 Similar rock falls can be expected at any time anywhere along the south edge of the Rockville Bench where the Shinarump Conglomerate stands in a near-vertical cliff face above the adjacent canyon floor.